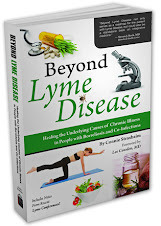 Lyme Bytes: Going To Germany! I thought I knew what I would be doing during the month of April. After months of desperately seeking solutions to my insidious back pain, I had finally settled upon a plan to get ozone injections at a clinic in Medellin, Colombia. And then my god came and blasted that plan, even after I had already purchased the plane ticket. Not that I know what God wants me to do most of the time, but occasionally, He makes it pretty obvious, especially when the ramifications of the decisions I make are expensive, in every sense of the word. I have been praying about an opportunity to go to Germany, to do treatments with the Bionic 880. But, not having a lot of dough to roll around in and kick about like autumn leaves, and not convinced that the machine will work a miracle on my body, I have held off on trying to scrape and scrounge for the funds to go to Germany. Instead, I have patiently awaited an "open door", believing that provision would come my way if it was meant to be. I tend to think that God is a slow poke when it comes to answering prayer, but the answer to this one came like lightning. I have oddly felt that if the Bionic 880 was a therapy that I was supposed to do, then certainly it would be down the road....six, ten, perhaps twenty months from now. But the angels showed up this week, and while I'm not exactly prepared to pick up and fly from Costa Rica to Germany in six days, I have been trying to get myself back into the, fly stand-by, fly-by-the-seat-of-your-pants mentality that I used to have back in the days when I was a flight attendant. 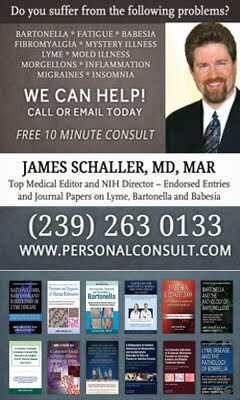 The timing isn't great; I'm trying to finish a new Lyme disease book and if I'm going to go to Germany I would rather sightsee instead of write a book, but I'm thinking that if I swing this right, I can do both--provided, of course, that the Bionic 880 doesn't have me holed up n' herxing too many hours of the day. Despite the abundant financial provision that I have received for this trip, it is still going to cut a big hole into my savings sock--and I do mean HOLE, as in, this is likely to be my last shot at treating my symptoms until I win the lottery or can work full-time again. But when my angels of provision were accompanied by a few friends who prayed and felt strongly that God was telling me to get on an airplane, then I decided that it was worth it to cut a hole in that sock and jump off one of the biggest financial cliffs of my life. Further confirmation came when I opened my bible today to this verse: "..awake thou that sleepest, and arise from the dead, and Christ shall give ye light..." Eph. 5:14. Light. As in Bionic light. Thanks, Jesus. It sounds silly perhaps, but to me, there was no mistaking the analogy. I really think my creator has a sense of humor sometimes. I can't swear that I will post blog updates as impressive or lengthy as Scott's or Joey's (two of my friends who went to Germany last year): www.betterhealthguy.blogspot.com, and pathogensoup.blogspot.com but I will try to post an update from time to time on my progress, because I know that the more reports that people get on this type of treatment, the better. So tonight, as I fall into bed exhausted from a long week of travel zig zags, a zillion appointments and work on my book, I praise my god for His mighty provision, and for the mighty love He that has shown me. Funny how the greatest blessings come right before I choose to believe Him for these things. I am so excited for you! You are in my thoughts and prayers for strength to work on your book, sight see AND go through the treatments. May this be YOUR place of healing! Jennifer, That looks like a fantastic blog! I will have to check it out. I believe prayer is the best way we can help one another. Renee, Thanks for your kind sentiments and prayers! I hope all is well with you. Vanessa Morgan (vrmorgan8@yahoo.com) in Durango, Colorado treats Lymes with the Bionic machine from Germany. Maybe you don't have to go all the way there. I am also doing Rife vibrational therapy in Albuquerque, New Mexico which is really getting me well after 25 years with this bacteria. This is the best treatment I've had so far and I love Robert Carpenter, the acupuncturist who knows what he is doing. Let me know if you need contact info. I've never posted to you before, but have been reading your blog for months when I get a chance. I just saw that you are going to Germany! How wonderful for you! I hope that you are able to make a lot of progress. 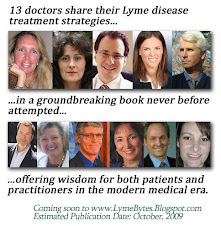 Thank you so much for keeping a blog, it has helped so many of us with Lyme. I also saw your youtube on MMS when I was researching that. France is next to Germany! Remember I live in Cannes right by the famous Hotel Carlton where the stars hang out during the film festival which starts May 13. If you still have access to free flights you could fly to Nice and we could meet up there or you would be wellcome to stay in my flat for a break. Email me at wpswallace@yahoo.com if you want to explore this. One condition dont bring your high heels I dont want to look like Scott beside you!!! I pray this helps you and that your road to healing will strenghen. Thanks for the info. on the person in Durango. I already have my ticket but it's good to know about another person who is using the Bionic 880. Candace, Joe, Agenias--thank you ALL for your kind words! I will report on my progress. I do pray that this turns out to be something that will help many. Glad that the blog has been an encouragement. I am excited to hear you are able to go! It has worked very well for me. I treated coinfections after returning to the US and have improved as much since I've been back as I did when I was there. Another spiritual analogy that hit me when I was discerning my trip was that Christ is the Light .... and the healer. I'm glad God has given you this gift. I look forward to hearing all about it. Thanks for the encouragement! I am so glad that you continue to heal with the Bionic 880. I will probably do a post later this week, I just got here last night, absolutely love the guest house! Oh!!! The guesthouse!! Give Mrs. Klein a BIG HUG for me!!! May God bless you and Troy with your bionic treatments. Make sure you get a good exit plan for the next few months before you leave if you buy the machine. Also, give Karin Klein a big hug from Ann S. I just left on March 24 and it has really helped me.